We’d like to sketch out here our thinking while going about the initial work of unplugging our course. ability to reflect on their learners’ language use in one lesson and select useful areas for closer study in a future lesson. If a session doesn’t surprise you as a tutor, you’ve been on auto-pilot. These principles were not formulated prior to the design process; far more, they emerged and crystallised during and as a result of the design process. We were both struck by how powerfully they had influenced our thinking and collaboration during the work of stripping our first week down and refitting it. In this way, the design process was a perfect illustration of principle number ten in action. Hopefully, this gives a clear picture of the thinking behind the course design process. In our next post, we’ll describe the actual design meeting and the shock we felt at watching a course write itself. I am very impressed with the definition of an A-grade teacher. I do have a question about the use of illustrative materials though – what’s the difference between using real course-books instead of copies from a unit, and why is it important? I also wonder if you could define what it means to be ‘alien’ to real life. Glad you liked the post and thank you for the interesting questions. I suppose the preference for “real” copies rather than duplicates comes down to a few things. First, why copy something you have lying around – save the trees? Second, whatever you want to look at is more in its natural environment so you get some broader familiarisation for free. Third, we feel less guilty about copyright infringement, even for educational purposes. Of course, this is an ideal that we don’t always live up to! I would say the following teaching techniques or behaviours do not have much of a routine place in most people’s everyday lives (though they may, under very specific circumstances, occur): modelling and drilling the correct pronunciation of a word; asking questions to establish how far something has been understood; organising small group work; finger-coding; using gesture to indicvate sentence stress etc. They can be useful but placing emphasis on them early on may not make much sense to trainees precisely because there is so little connection between them and the trainee’s knowledge and experience base. I believe in the pedagogic value of moving from the known towards the new so if I can establish useful applications for known and familiar behaviours in the classroom first, it may be easier to subsequently make sense of things like this which may otherwise simply be taken on as unprincipled rituals. Hope that’s helpful and thanks again! Yes, that is very helpful, thanks. I particularly like your guiding principle of moving from the known to the new – it’s good to boil things down to fundamentals like that. Thanks for the feedback. Look forward to hearing from you again soon! 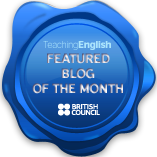 I just watched your presentation at IATEFL on-line and read through your blog – right now I’d just like to say a very big thank you for letting everyone know what you’ve done and what you’re doing. I work at a large teacher training centre in Barcelona where we run a lot of CELTA courses and Dogme is something we have been aiming at for some time. It’s great to see how you have got so far ahead of us. Thank you for stopping by. Scott Thornbury has said on more than one occasion that you have been working for years in the way that we have been aspiring towards – so for you to say “thank you” to us is an extremely great honour! We had immense fun at the conference and this has given us a great boost to continue sharing what we are doing on this blog – Izzy will soon be posting on how day three proceeds, for example, so please do drop by again!